RSVP before Wednesday, April 10 for free registration. 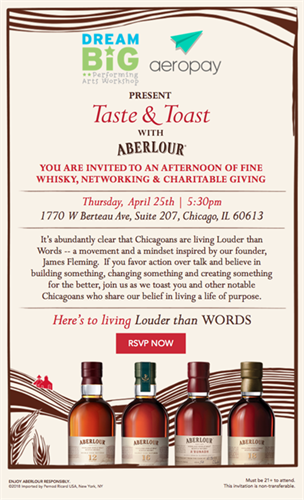 AeroPay is partnering with Arberlour to bring you an evening of fine whisky, networking, and charitable giving. This April we have invited our neighbors, Dream Big Performing Arts, to share with us how they give back to the community while we network and nosh. It will be a relaxed evening to meet new people, promote your business and catch up with colleagues. Plus enjoy complimentary bites and beverages provided by Arberlour.